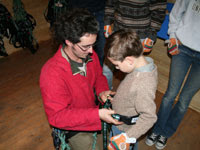 Treetop assult course - Zip lining in Brittany. Le Park de grandes chenes not far from Mont St. Michel is a beautiful place. The park has various activities for children and adults. There is a big lake with small electric boat rides, various walks, pony rides, cycle paths and seven levels of treetop assult courses. Everybody gets a thorough training session before being allowed to go up and by the time they are finished you feel ready to take it on. For children under 8 the first course is only a few feet off the ground but exciting enough for their first go. They always want to get onto the bigger one once they have completed the junior course. The adult courses start at 6 meters and goes on to the Purple course which is 30 metres off the ground. I haven't done this yet but would love to give it a go if I can tempt anyone up with me. I did wimp out a couple of times but a freindly French block behind me gave a shove which you need sometimes when your nerve fails. For the adult courses you would need a full day so pack a picnic, plenty to drink and put on your trainers, loose trousers and be ready to ache all over. It's really a thrill. I loved it. For the less sporty, there is a cafe on site and nice views. There are also plenty of picnic areas where you can stop for lunch. A great day out with children, adolecents, or friends.